I am making kitchen countertops using white oak. So far I have just used General Finishes gel stain followed by several coats of Arm-R-Seal. For the top that holds the sink, I would like to fill the grain a bit more against the moisture it will surely get. I have not been able to find a single article, from General or anyone else, about the sequence of that. Tonight I’ll try a clear Z-poxy resin fill on scrap with plans to sand that back to wood and then apply the gel stain over it. I don’t see a way around that sequence since the filler has to be flattened which would wreck the color if it was put on first. On the other hand, the clear filler will keep the stain from getting into the pores. I might dump a little stain into the epoxy on another piece to see if it will dry. So depending on what look you are going for, check this out, based on using clear AquaCoat grain filler(get from Rockler or Amazon), note the Optional steps depending on what you want. Since you’re doing test boards (smart man), try one with some Pore-O-Pac natural oil filler and tint it with your stain. 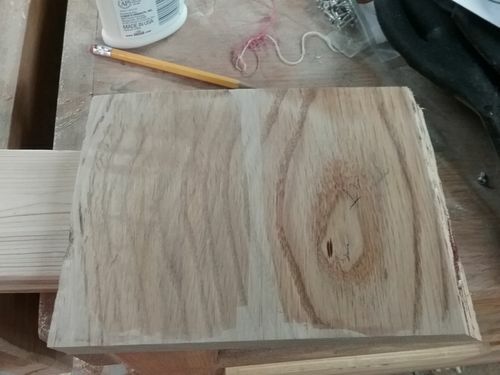 Wipe in the filler across the grain, level it with a scraper and then it’ll be a breeze to sand it smooth in a few hours so you can apply stain to the wood. Thanks gents. I tried a very unmeasured glob of the gel stain in the Z-Poxy finishing resin (great stuff). So far, I’d have to call this an unqualified success. The first picture shows half of the board with straight Z-Poxy and the other half tinted. You can see the difference in the grain fill. The second pic has a wash of the gel stain over both halves of the board. 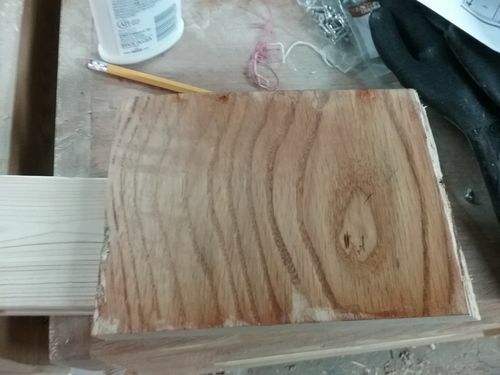 It doesn’t show the grain difference as much in the shot but it is there and much closer to just the stain on raw wood. I used Aquacoat on my last table build, which was Sapele so very open grain. I stained first, then filled the grain and sanded it back to level before applying clear top coat. No issues sanding through the stain.